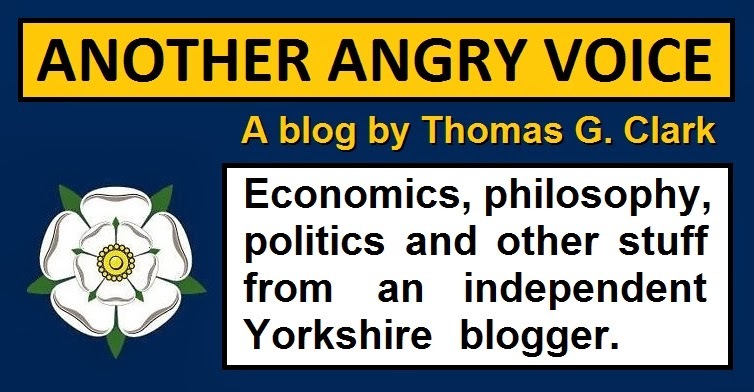 Why was this vile extreme-right hatemonger given airtime on the BBC? When the extreme-right hate-monger Jonathan Jennings was jailed the BBC ran a short piece on their website about his 16 month sentence for multiple offences between March and August 2017, which included extreme anti-Muslim and anti-Semitic abuse and a threat to kill Jeremy Corbyn. 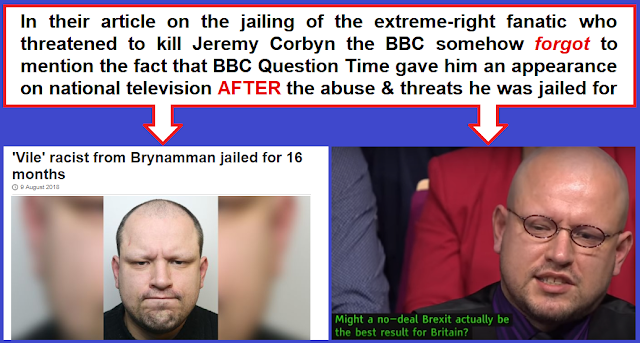 One thing the BBC somehow 'forgot' to mention in their article was that this extreme-right fanatic was selected by BBC Question Time producers as one of the select few to be awarded a question on live TV in November 2017 (after the abusive messages and death threats he was jailed for). 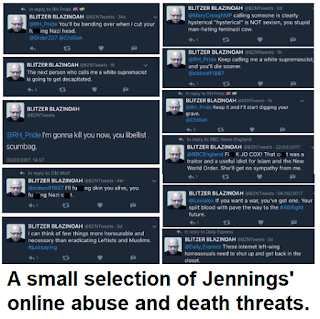 By November 2017 Jennings' online abuse had already been well documented and reported to the police, but the BBC somehow managed to pick him out of an entire crowd as one of the lucky ones to be given a question. It beggars belief that the BBC somehow managed to pick one of the most vile extreme-right fanatics in the UK to be be given a question. 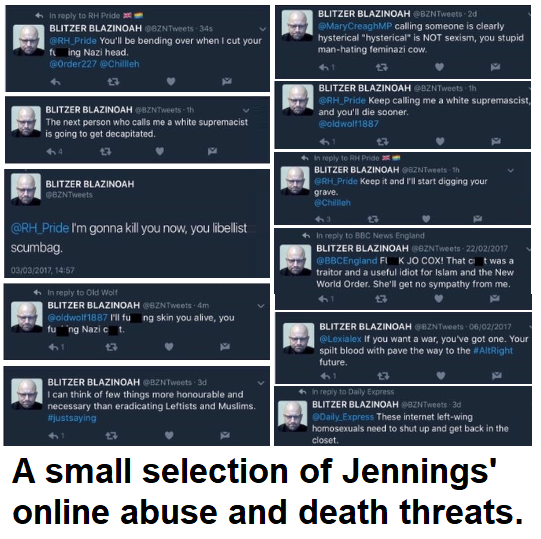 Even the most cursory of background checks would have come across Jennings' White Genocide podcast and articles like this one detailing his extremist views, like "all those who oppose Donald Trump must be killed". Whichever way you look at it, the BBC's platforming of this vile individual is unforgivable. Either they knew about the White Genocide podcast and the Twitter abuse and decided to give him a platform because they believed that extreme-right fanatics like him are more deserving of a question than any of the scores of decent ordinary people in the crowd, or they didn't bother to do the slightest check on who they were awarding airtime to. The vile hatemonger Jonathan Jennings was jailed last week for a mass of extreme-right abuse & death threats (including a threat to kill Jeremy Corbyn). Here he is being given airtime on @bbcquestiontime AFTER he posted the comments he was jailed for. Anyone who is familiar with the continual stream of Tory party activists who have been handed headline questions on Question Time must surely suspect that Jennings was not given a question on the show despite his vile extreme-right views, but because of them. Jennings was so delighted at having been awarded the chance to push for a hard-right "no deal" brexit on national television that he uploaded a clip of his Question Time appearance on his extreme-right White Genocide podcast. It's hardly a surprise that the BBC 'forgot' to mention the fact that they gave this jailed extreme-right fanatic a platform on national television less than a year ago, because had they (or anyone else in the mainstream media) bothered to mention it, surely people would be demanding an investigation into how on earth it happened, and whether the show's producers were aware of his extreme-right activities when they made the decision to put him on air.